, a gentleman of a Derbyshire family, was born in London, and in 1604 became a commoner of Brazen-nose college, Oxford, under the tuition of the pious Mr. Robert Bolton four years after, he took a degree in arts, and then removed to the Middle Temple, where he studied law, became a bencher, and of considerable reputation in his profession. In 1639 he was elected Lent reader, and chose for his first reading an argument very suitable to the growing turbulence of the times, endeavouring to prove that a parliament may be held without bishops, and that bishops ought not to meddle in civil affairs, but the lord keeper Finch, at archbishop Laud’s request, ordered him to desist. This, however, giving bim a character unhappily too popular, he was elected M. P. for the borough of Southwark, in the parliament of 1640; but | perceiving the outrages the members were about to commit, beyond all bounds of temperate reformation, he went to Oxford, and sat in the parliament called there by the king. After continuing at Oxford for some time, he was taken prisoner by the rebels in Oxfordshire, and sent to London, where the house of commons committed him to the king’s bench, and he suffered afterwards in his estate in Northamptonshire. On the Restoration we find him treasurer of the Middle Temple. He died in 1662, and was interred in Morton-Pinkney in Northamptonshire, leaving two sons, Henry and Edward, of whom some notice will be taken. He published, 1. 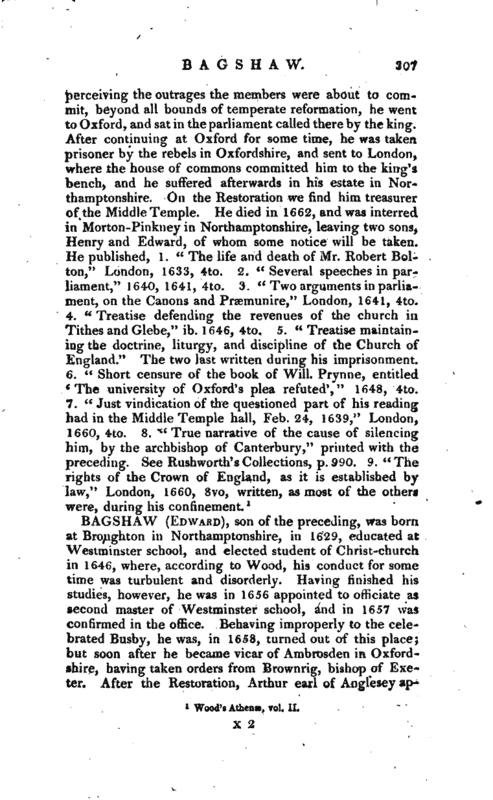 “The life and death of Mr. Robert Bolton,” London, 1633, 4to, 2. “Several speeches in parliament,” 1640, 1641, 4to! 3. “Two arguments in parliament, on the Canons and Praemunire,” London, 1641, 4to. 4. “Treatise defending the revenues of the church in Tithes and Glebe,” ib. 1646, 4to. 5. 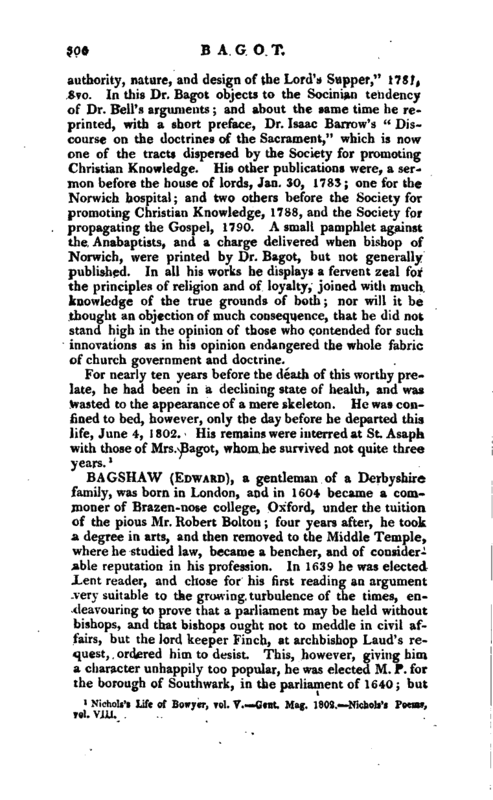 “Treatise maintaining the doctrine, liturgy, and discipline of the Church of England.” The two last written during his imprisonment. 6. “Short censure of the book of Will. Prynne, entitled ‘The university of Oxford’s plea refuted’,” 1648, 4to.